Tawara Tōda, "Lord Bag of Rice"
a samurai named Fujiwara Hidesato came to a bridge that spanned the beautiful Lake Biwa. He was about to cross it when he noticed a great serpent fast asleep, in the middle of the bridge. Hidesato, without a moment's hesitation, climbed over the dragon and went on his way. He had not gone far when he heard someone calling to him. He looked back and saw that the dragon was gone. In its place, a man stood bowing to him courteously. He was a strange looking man with a dragon-shaped crown resting on his red hair. "I am the Dragon King of Lake Biwa,"
explained the red-haired man. "A moment ago I took the form of a dragon in the hope of finding a mortal who would not be afraid of me. You, my lord, showed no fear, and I rejoiced exceedingly." "A great centipede lives in the woods on the mountain. Every day he comes down to the shore to drink. He dips his thousand poisonous feet into the beautiful water, turning it all foul and dirty. He enters my palace, and destroys my children and grandchildren. One by one they have been eaten by this creature, and I fear that unless something can be done that I too will be eaten. I have waited a long time for a brave man. All who have seen me so far as a dragon have run away. You are brave, so I beg that you will kill my enemy." "I do not know if I can help you, but I will gladly go with you and try." When Hidesato reached the Dragon King's palace he found it to be a magnificent building, hardly less beautiful than the Dragon Palace of the Sea. It was a beautiful house, all made of coral and pearl. His servants, the crabs and sunfishes, brought them rice, fruit, and tea, served on tiny green leaves. The tea looked like water and the rice looked like seafoam, but they tasted all right. While he feasted ten goldfish danced, and just behind them ten carp played skillfully on the koto and shamisen. Hidesato was thinking how excellent the entertainment was, when they heard an awful roaring and rumbling. It sounded as though a mountain were being torn up. Hidesato and the Dragon King hastily rose and ran to the balcony. They saw that Mount Mikami was scarcely recognizable, for it was covered from top fo bottom with the great coils of the centipede. In its head glowed two fiery lights, and its hundred feet were like a long winding chain of lanterns. 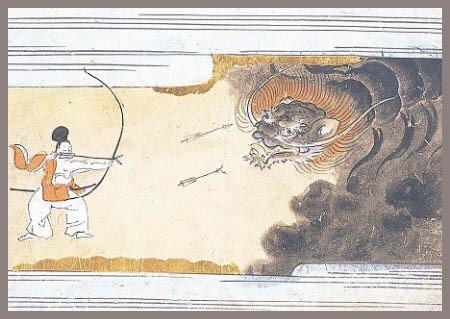 Hidesato fitted an arrow to his bowstring and pulled it back with all his might. The arrow sped forth into the night and struck the centipede in the middle of the head, but glanced off immediately without inflicting any wound. Again Hidesato sent an arrow at the monster, where it struck and fell harmlessly to the ground. He had only one arrow left, and the monster was almost at the water's edge. It took just a second to wet the head of his last precious arrow and send it whizzing at the centipede. It struck him on the forehead and he fell over dead. Lake Biwa, with its palace beneath, was shrouded in darkness. Thunder rolled, lightning flashed, and it seemed for the moment that the Dragon King's palace would fall to the ground. The next day, however, all signs of the storm had vanished. The sky was clear and the sun shone brightly. In the sparkling blue lake lay the body of the centipede. The Dragon King and his family and servants were overjoyed. Hidesato was feasted again, and when he departed a retinue of fish turned into men escorted him. The Dragon King gave Hidesato five gifts: two bells, a bag of rice, a roll of silk, and a cooking pot. The Dragon King accompanied him as far as the bridge. When he reached his home, he found he had been given no ordinary gifts. The roll of silk would never empty no matter how much of it he used, the cooking pot would cook without need of any fire, and best of all, the rice bag was inexhaustible. Only the bells were ordinary, and these he presented to a nearby temple. He grew rich and became famous. People no longer called him Hidesato, but Tawara Tōda, or "Lord Bag of Rice". translated by F. Hadland Davis and Teresa Williston. Fujiwara no Hidesato was a real historical warrior, most famous for his famous defeat of the rebel warrior Taira Masakado (for more information on this episode, see Karl Friday's The First Samurai). Interestingly, Masakado was also said to have been slain by an arrow. This story is said to have taken place before his battle with him. The Tōda part of his name actually means "firstborn son of the Fujiwara", and the Tawara part, rather than meaning "straw sack" as the folktale says, was likely taken from a town where Hidesato lived later in his life. Insects and spiders in Japanese folklore were thought of as impure but supernatural creatures, mostly because of the way they ruined crops. Centipedes (mukade 百足) were no different. This story, while more about the centipede than the dragon, aptly illustrates the differences between Eastern dragons (ryū or tatsu 竜) and Western ones. In the East, dragons are creatures of air and water, living either in the heavens where they fly without wings, or in the depths of lakes or oceans. They are also creatures of order, and represent wisdom, age, strength, and supernatural power. Contrast this to the fiery, chaotic role of the dragon in Western myths and fairy tales. In the West, dragons are always a threat to the heroes, something to be defeated and against which one can test himself; while ryū are nearly always messengers of heaven or beings of good. There are exceptions, of course, such as Kiyohime, and a man who was reincarnated as a great serpent to take his revenge (which, while antagonistic, is far from evil). 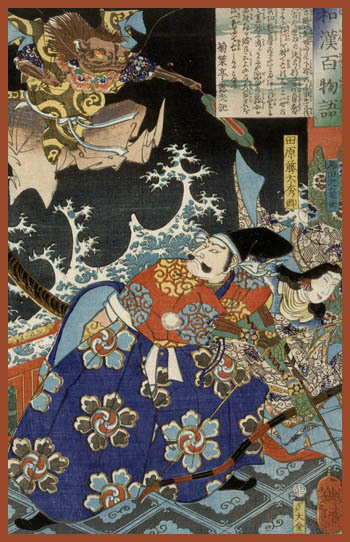 The Dragon King (Ryūō 竜王) in this story is not the same as the Dragon King in other stories; in folklore, every body of water might have its own dragon. Ryūgū 竜宮, the Dragon Palace of the Sea, is also referenced. This palace appears in other tales such as "The Monkey's Liver" and "Urashima Tarō". As Japanese were largely unfamiliar with red-haired people, the colour was used to indicate a stranger or a supernatural person.
. . . CLICK here for Photos of the scroll !
. Bishamonten and the Mukade Centipede .
. mukade 蜈蚣 centipede .
. Poet Tawarabo 田原坊　. He was born in Sagawa no Kuni (Kanagawa prefecture) in the late Edo Period. In Sagami, even now there are many people with the name of TAHARA. Tawara no Toota 俵藤太/ 田原藤太（たわらのとうた）. The temple has a kote-e こて絵 stucco relief painting by 今泉善吉 Imaizumi Zenkichi, a student of the famous stucco master 伊豆の長八　Izu no Chohachi. 『龍図』 Dragon and 『俵藤太』Tawara no Tota. 鶏足寺 Keisokuk-Ji "Temple dedicated to the legs of a hen"
In 939, Masakado Taira( a general of the Heian period) started the war that betrayed the Imperial Court. During the next year, Hidesato Fujiwara fought with Masakado, obeying the emperor's instructions. At this time, the highest Buddhist priest of the Sesonji Temple prayed for Hidesato's victory. Using Buddha's teaching, he offered the neck of Masakado which was made of clay. He kept praying every day and every night. Finally on the eighth day, he fell asleep. In his dream, he found a hen who had three legs treading on Masakado's bloody neck. When he awoke to the hen's laughing voice, he saw Masakado's clay neck had three footprints clearly stamped in it. In the 17th day of the full moon, Hidesato beat Masakado. The name of Sesonji Temple has changed to Keisokuji Temple.